Bitterness does not pay. Certain things have happened to all of us in the past and it is for us to forget those and look to the future. It is not for our own benefit, but it is for the benefit of our children and children's children that we ourselves should put this world right. 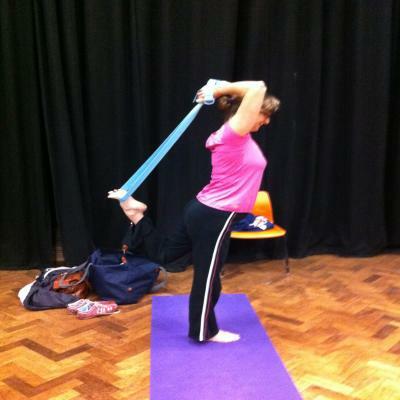 Natarajasana is usually known as the dancer pose. Nata means dance in Sanskrit and raja is lord or king. Hence the title Nataraja gives the Lord of the Dance and in the Hindu religion this takes us to Siva, the god of death and destruction. It is important to realise that there is the recognition that destruction is sometimes needed before creation and new beginnings can emerge. Siva is also associated with fire and the use of fire to purify. In a dualism that is hard to comprehend Siva is also the god of mystical stillness and the Lord of the Dance. As a Christain, I love the hymn "I am the Lord of the Dance, said He" and often I sense that the physics of dancing quantum particles leads us into divine truths. This posture will extend the hip joint backwards, it will strengthen the supporting leg, it will improve the flexibility of the shoulder, open out the chest and improve all the vertebral joints. 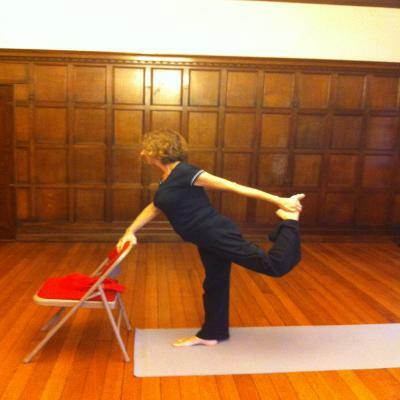 In theory it is a balance pose but many of the benefits of the asana can be obtained using a chair to hold on to. 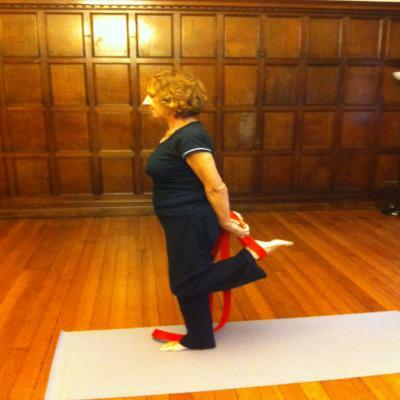 In my classes where several students have difficulties for one reason or another I start by a basic quad stretch. 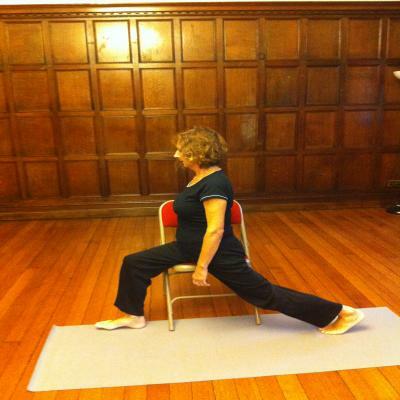 If a student needs to use a chair to do this stretch, then the chair will be needed to practise Natarajasana until the supporting leg is stronger and the balance has improved. Natarajasana works on the hips, stretching the psoas major and the iliacus who normally work together to flex the hip, as in sitting down. Here they will have a chance to stretch and maybe relax! To explore how well a student may be able to do the hip extension, we use chairs as shown. The student below needs to work on straightening the back leg. If as a teacher, you can see there is little movement in the hip, it is better for the student to continue to practise this pose than to move on to the Dancer pose. Return to the basic standing posture Tadasana and then stretch the arm out. We are using a chair so the student will not lose her balance. Then she lifts the opposite back leg, holding it with her other hand. Encourage the student to push the leg away opening up the space, ultimately the thigh will be parallel to the floor and the right shin will be at right angles to the thigh. If the student is clearly at ease doing this then s/he can move away from the chair and explore the posture as a balance. Initially it is likely that the student will bend the supporting knee. As the student gains strength and confidence, the supporting leg can be straightened. In the photo below, there is still some work to be done by pushing the lifted leg away a bit more to enable the shin to become perpendicular. However most of my students would be very pleased to have held this position. Did I talk about opening out the chest and work in the shoulders? I did and that takes you to the full Natarajasana where both hands reach out up and behind the head to catch the lifted leg. I have managed it once, in a five hour yoga session with Kofi when I was in my early thirties. This is how to progess still further. Using a belt to help you join the feet and both hands together.